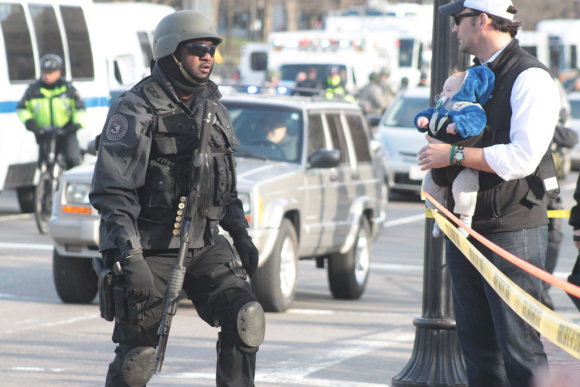 I wrote a piece for Media Nation, which is Northeastern Professor Dan Kennedy’s blog, about my experience covering the Boston Marathon bombings and the manhunt in Watertown later in the week. You can check that out above. Note: Northeastern journalism student Taylor Dobbs covered the Boston Marathon bombings and the final standoff in Watertown from the scene of both incidents, publishing stories and photos in Medium. Here he offers some advice to young journalists: Show up; be a witness; tell us what you know; don’t guess at what you don’t know. In a fast-moving, violent situation, fear and confusion naturally prevail. Facts and hard truths are at a premium, and the most difficult thing to do is separate these disparate pieces and figure out what is happening. As a journalist, I knew this was my job on the ground when I arrived at the edge of the police perimeter on Monday, April 15, minutes after a pair of bombs echoed through the crowded streets of Boston and then again when I headed to MIT after shooting was reported on the campus. A Boston SWAT officer spoke with a passerby near Boston Gardens. I live four blocks from the finish line of the Boston Marathon, so I heard the bombs go off on Monday, April 15, 2013. A few minutes later, I was outside taking photos. I wrote for Medium about the experience of walking through Boston as it went from a city in celebration to something out of a movie; SWAT teams, Army National Guard troops on Boston Common and non-stop sirens. For Thursday, I wrote my column in The Huntington News about the bombings and the city in mourning Boston had become. I was interviewed by BBC World News and Vermont’s Fox 44 about the day’s events, and one of my professors, Dan Kennedy, featured my post in a roundup of writing about the attack. My coverage on Twitter in the hours immediately after the explosions got the attention of Mark Fischetti, who wrote a post about the value of social media during breaking news events. Meg Heckman, a graduate student at Northeastern who I’ve had the pleasure of working with this semester, wrote about the “Golden Hour” of news and the potential Medium has to become a haven for the photo/essay style of my post there. Then, on Thursday night, news broke of a shooting at MIT, just across the river from my apartment. I grabbed my phone and ran over the bridge, where I met up with Seth Mnookin and Brian D’Amico, an MIT professor of science writing and a breaking news photographer, respectively. I knew both from Twitter, but hadn’t met either. We were standing behind the police tape chatting when a group of police cars sped away from the scene. The three of us hopped into Seth’s car and followed. We ended up being the first reporters on the scene in Watertown, arriving minutes after a gun fight between the Tsarnaev brothers – ultimately named as suspects in Monday’s bombing – and police. I wrote my account of the night for Medium. Seth Mnookin wrote about the scene in Watertown for The New Yorker. Brian D’Amico published his photos on Flickr. In my home state of Vermont, the Burlington Free Press’ Matt Ryan wrote a story about the adventure. The paper also published some of my iPhone photos from the night. My former editor, Anne Galloway of VTDigger.org, also wrote a story on the experience. I had the privilege of speaking with David Kroll’s newswriting class down at North Carolina State University in Raleigh, N.C. as well. I’ve been a columnist for The Huntington News this year, and recently got the chance to write a column about the family that runs a popular sandwich shop on Northeastern’s campus. If you have been into Chicken Lou’s in the past couple of years, you might have noticed a photo of two Marines next to the cash register. Maybe you asked one day, like I did, who’s in it. If you asked Denise Styffe, the white-haired woman whose boisterous personality behind the counter keeps Lou’s running during lunch rush, she probably didn’t take her eyes off the photo when she answered you. The Marines are her son Danny and her nephew Eric. The pair grew up together in Arlington, the grandchildren of Lou Ferretti, better known as Chicken Lou. As Lou, Denise, her sister Dianne and her brother David served up lunch to Northeastern students for the past two decades, Danny and Eric were dreaming of putting on their uniforms and shipping off to war. Their units had a week-long overlap in North Carolina shortly before they were set to be sent to Afghanistan. They got to spend some time together, and that’s when the photo was taken. It’s the last time they’d ever see each other. Weeks later, as Denise anxiously awaited Danny’s call from some base a world away, she got totally different news. Eric was dead. 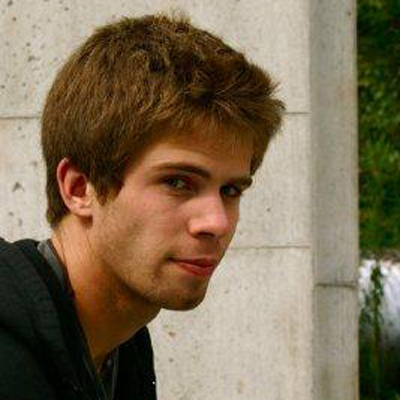 He’d died in his sleep shortly before he was set to join Danny and the thousands of other U.S. troops in Afghanistan. The call from Danny came a little while later. He was about to get on a helicopter and fly into harm’s way – a combat outpost where he’d stay for four to six weeks with no way to call home. Her son’s temporary departure and her nephew’s permanent one made 2011 a difficult year for Styffe. As she helped Dianne, Eric’s mom, through the tragedy, she had the constant worry that a car full of Marines would pull up to the house, a sure sign that the worst had happened. But Eric’s death – at home in his bed, by some strange confluence of biological events – in an odd way, gave Denise a peace with the forces at work. “No matter how much I worry, no matter how much I do, God makes His final decision,” Styffe says, sitting outside Chicken Lou’s on a sunny Monday afternoon. “It’s hard,” she tells me more than once. She sends Danny a text every night before she goes to bed, knowing he won’t read them for months. But she wants him to know, upon his return, that she was thinking of him every night. When I ask about Danny’s first tour, his mother raises her eyebrows and covers her eyes. He won a medal on that tour. Taking sniper fire from two places, she says, Danny ran into the open with a rocket launcher and took out one of them, returned to cover to load a new rocket and did it again. He was awarded the Navy and Marine Corps Achievement Medal with Valor for his actions. “When I found out I was …” Denise holds her arms out in a strangling motion. “I kept telling him: ‘When the bullets fly, play possum,’” she says. But she knows he won’t. With eight soldiers in his command now, Lance Corporal Daniel Styffe is trained to react first and think later. He’ll run into fire for them, and they’ll do the same for him. Denise knows that’s what keeps him and his men alive, but it doesn’t help her rest easy at night. “Hey!” her brother David, a Northeastern alumnus, is yelling at me from behind the counter. “Don’t let her tell you she’s younger than me.” We all laugh (I didn’t ask her age), and I see the weight of the worry leave Denise. The constant banter with her brother and her youngest son Tyler, who also works at Lou’s, make me feel less like I’m at a sandwich joint in the middle of campus and more like I somehow walked into the Styffe kitchen and struck up a conversation. In many ways I did; Chicken Lou himself came into work every day until he died in 2002. He sat in the worn green chair that you can still find between the drink coolers. It’s easy to see why Denise is able to come in to Lou’s and stay upbeat, with the support of her brother David and son Tyler under the same small roof along with many members of the Northeastern community who stop in and ask for updates. Three weeks ago, Danny called in the middle of the night. She knew as soon as she saw the strange, four-digit number on the caller ID: He was getting on another helicopter, flying to another remote outpost. Going to war again. At Chicken Lou’s that day, I asked Denise about her son, as I had a couple times before. “I got the call last night, actually. He just went out,” she said cheerfully while she rang up my TKO, as though she was telling me about a hockey game he played in, not a war. No evidence of the weight of worry, or the hundreds of prayers or texts she would send over the next weeks and months, hoping that in time both will be answered. You are currently viewing the archives for April, 2013 at Taylor Dobbs.